Chengfeng Xia and co-workers from the Chinese Academy of Sciences have reported in JACS on the syntheses of corynoxine. C&E News had an interesting article on the scents of the season. Masayuki Inoue and co-workers at the University of Tokyo have reported in ACIE on the synthesis of manzacidin A.
Masayuki Inoue and co-workers have reported in ACIE on the synthesis of lysocin E.
Karl Heinz-Altmann and co-workers at ETH Zurich have reported in ACIE on the synthesis of fidaxomicin aglycone. Michael Sherburn and co-workers at Australian National University have reported in ACIE on the synthesis of ramonanins A-D. I just thought I’d point some difference in responses between two recent retractions in Science vs. Nature. There were two Nature papers recently retracted on stem cells from a group in RIKEN and it was all over the news in Japan. On the other hand there was a Science paper recently retracted on a retro-“click” reaction reported by a group at the University of Texas, which was covered in C&E News. Because I have been in both countries during the time these retractions occurred, I just thought I’d point out an interesting difference in response by the media (news coverage). I remember being in Japan around January 2014 and turning on the news on the television and seeing a woman with a face full of tears at a press conference on almost every channel they showed the news. I wondered what it was about, and it was something about making mature cells into stem cells by treating them with acid. It was a big deal and a topic of discussion in probably every news show as well as of course your science news and blogs on the internet. Meanwhile in the US, I don’t recall as much of the time when I heard about the Science retraction (looking back, it was around June 2014) but I remember seeing C&E News and other blogs (retractionwatch, pipeline corante) about the retraction in the US lab. The article was about reversing the click reaction (azide and alkyne coupling to make a triazole, and the paper was about doing the reverse reaction). I don’t think I have to be a science expert but it wasn’t as much of a big deal in the media – although still a serious debate about falsifying data and getting it published. I don’t remember seeing this story on the television. I was just wondering, if the research was happening in the opposite countries (stem cell research in US and reverse click reaction in Japan), would a retro-click retraction of a Science paper be as big of a deal in Japan? And the other question: would a stem cell Nature paper retraction be as big of a deal in the US? Is it a difference between: (1) the importance of science in the media in the two countries, (2) the importance of the research areas (stem cell vs. basic science), (3) the genders of the lead authors (male vs. female), (4) a Science paper vs. 2 Nature papers, (5) a combination of all of the above, or (6) something else I did not mention? Xuefeng Jiang and co-workers from East China Normal University have reported in Tetrahedron Letters on a review (called a “Digest Paper”) on different desymmetrization approaches to access natural product structures. I guess Tetrahedron and Tetrahedron Letters are publishing reviews now. The abstract looked like it had Mickey Mouse on it. 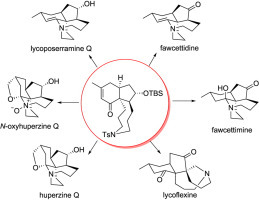 Gang Zhao and co-workers from the Chinese Academy of Sciences have reported in Tetrahedron on the syntheses of some lycopodium alkaloids.